The honeymoon appears to be over for FSG, with those suspicious of the owners now encapsulating more than just fans blindly loyal to Kenny Dalglish. Not succumbing to Gylfi Sigurdsson’s extra wage demands was fair enough, but their tightfistedness over the transfer of Clint Dempsey has left Liverpool’s already faultering attack too thin. John Henry’s talk of “not overpay[ing] for players” is understandable but unreasonable given the comparatively small fee Fulham were asking for and the new man in charge of the club, showing Brendan Rodgers’ already difficult project little support. Throw in memories of the American owners that preceded them, Tom Hicks and George Gillett, spending well in their first transfer window before stripping the club until it almost went into administration and eyebrows raise a bit further. Regardless, they seem to have made a fairly popular appointment in Rodgers. Despite being at the top of few lists other than FSG’s, the coach’s philosophy fits in well with Liverpool, albeit his unproven status is a considerable risk at a club still struggling to find its feet. Ajax’s culture of passing football, which was passed on to Barcelona by Rinus Michels and Johan Cruyff, is well-documented, but Liverpool’s (and, seeing as I’m just throwing around names, Dynamo Kyiv’s) is often overlooked, at least in England, so the return to the style seen under Bill Shankly and Bob Paisley is welcome. The problem is whether or not the current crop will up to it – more of an iphone slots to Barcelona’s Las Vegas casino. Had Rodgers inherited the side Dalglish did, there would be few problems. Rafa Benitez had cultivated an intelligent and talented squad of players who, thankfully, Roy Hodgson mostly didn’t have the opportunity to leave his mark on. Upon his return, Liverpool clambered their way back up the table playing a brand of football not unlike Rodgers’ to much success. Over the summer though, following a trend he’s shown at every club after his first spell at Liverpool, Dalglish looked to make the team more functional and ended up making them far less so. The smart Raul Meireles and Alberto Aquilani were shunned in favour of Jordan Henderson, who although good wasn’t ready for the first team, and Charlie Adam, whose brain is where football goes to die; complete striker Fernando Torres was swapped for bulky target man Andy Carroll; and the ghosting Maxi Rodriguez was constantly overlooked in favour of the uncanny ability of Stewart Downing to both get in the way of everyone and be anonymous. Dalglish wanted to add the option to play the more direct traditional English style on top of the passing football of the year before, but ended up just adding players who couldn’t play passing football. Nevertheless not everything is broken. There were key problems in Liverpool’s overall play last season, yet the results still didn’t match the quality of play. Liverpool’s main problem was an inability to finish chances – having spent all their money on players with good chance creation statistics, they neglected that someone has to convert them. Providing he can fix that issue, Rodgers has a stronger starting point than most would imagine, and as an excellent speaker and open coach we have plenty of interviews we can use to apply his philosophy to the current Liverpool squad. Rodgers has made what he expects of his goalkeeper clear: “when we have the football everybody’s a player. The difference with us is that when we have the ball we play with 11 men, other teams play with 10 and a goalkeeper.” On paper, this is an immediate plus: Pepe Reina is arguably the best sweeper-keeper in the world, comfortable enough with his feet to have played in midfield for Liverpool during pre-season friendlies. The problem comes from whether Reina is one of the best goalkeepers in the world any longer. His downfall last season was overstated – he was just no longer winning us points on his own – but performances so far this season suggest it may be more than just a blip, although the difficult start hasn’t been exclusive to him. So far, there seems to be some teething issues with switching to a pressing system, but these should be temporary. Benitez’s Liverpool had an emphasis on pressing and the backline is suited to it. With an adapted defence ahead of him, Reina may be more confident and will be comfortable sweeping up behind them, while Martin Skrtel and Daniel Agger are arguably the strongest partnership in the league, also suitably classy on the ball for Rodgers’ style. Glen Johnson’s attacking abilities don’t need discussing but his improved defending has gone largely unnoticed outside of Liverpool, ironing out the positional mistakes and most of the lapses in concentration that have plagued his career. Left-back is the only defensive position that really needs strengthening. After a promising start, Jose Enrique now doesn’t look up to being anything other than a stop-gap, while Jack Robinson has great potential but is a risky choice at 19. There’s another more left-field option: seen as the solution to a problem that may not have existed, Stewart Downing proved to be a terrible purchase, frustrating fans not just with his ineffective performances but also his undeserved starting place ahead of Maxi Rodriguez. However, there have been growing calls among Liverpool fans for him to be moved to full-back, and it seems Rodgers has similar ideas. Most of the best attacking full-backs have history as a winger, and Downing has attributes that make him better-suited than most for a move backwards: the discipline and workrate to succeed defensively while the increased difficulty of tracking him from deep means he will have more time and space to ensure his crosses aren’t just bouncing off defenders’ backs anymore – he’s an interesting solution to a position that’s been a problem throughout Liverpool’s history. The defence may be jittery at the moment, but should be sturdy looking forward – it’s ahead of them where things start to break down. Rodgers has said he believes 4-3-3 allows for the most dominant control over a game, yet has mostly opted for a 4-2-1-3 . The loss of Lucas Leiva is the main reason for this – it was his injury at the end of last year that curtailed Liverpool’s season, and his thigh problem is a huge blow for Rodgers. No other midfielder is able to offer the controlling presence and defensive cover the Brazilian can, so Liverpool will be forced into playing with a double pivot. 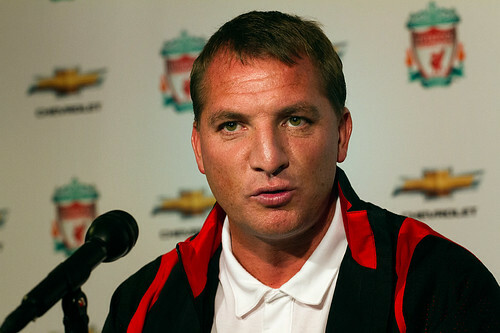 Nevertheless Rodgers has bought well with the addition of Joe Allen. Dismissed by some as more overspending on British players, the £15million price tag seems perfectly reasonable for a solid defender, clever passer and close dribbler. He doesn’t offer quite the same level of defensive cover as Lucas, but he is more dynamic and mobile, able to nip in to intercept and carry the ball forward quickly where the Brazilian cannot. The other addition of Nuri Sahin is just as good – a more creative player than the other two, he should be brilliant once he adapts and regains his fitness. Outside of them though, things get a little sparse. Steven Gerrard is one of Liverpool’s greatest ever players, but injuries have stolen his bursting runs away from him and he’s having to settle into a more restrained role. The problem is that, although he has worked on his decision-making, he still too frequently attempts an early killer ball that just gives away possession and doesn’t track runners well enough to play in a deeper role. Jonjo Shelvey looks as if he will become a very good player, but after an excellent pre-season very much looks “the new Gerrard” he has been dubbed, mixing some nice passing, good runs and excellent finishing with over-zealous tackling and inappropriate long shots. Judging by his lack of action so far, Jordan Henderson doesn’t seem to have impressed Rodgers, which is disappointing as the 22 year-old would probably excel in Rodgers’ system. He garnered attention at Sunderland for his crossing, but it was his neat passing that impressed in his debut season at Anfield, knitting play together as a shuttler, albeit his contributions flew under the radar of many fans. Ahead of them, the squad looks even thinner. Having offloaded the clever trio of Maxi, Dirk Kuyt and Craig Bellamy over the summer, you would think the cuts to the wage bill would afford a new manager a bit of spending power, yet Rodgers has been forced into starting a 17 year-old on the wing for most of his games in charge. Fortunately Raheem Sterling has looked more than capable, scaring defenders with his pace and dribbling. On the other side, Fabio Borini has had a mixed start, although it remains an interesting move which has been discussed on the site previously. Oussama Assaidi could prove a good signing, but it’s a risky move to throw an unproven winger in at the deep end – a decision Rodgers has little choice but to make. Joe Cole’s still kicking about of course, and his time at Lille seems to have improved his footballing brain based on the glimpses we saw of him in pre-season, yet whether he will be able to huff and puff his way into running for more than three seconds remains to be seen. Rodgers seems to have reserved the central spot for Luis Suarez as things stand, which makes sense as he wants to keep the Uruguayan as high up the pitch as possible, claiming “his strengths for me are in and around the box”. In a looser role where he looks to drop deeper or roll players – Rodgers calling him a “false winger” – he is less likely to be pulled deep into his own half defending as he would be in the right-sided role he occupied at Ajax and is still able to play to his strengths, however his poor finishing has posed a real problem, hinting that a different option is perhaps a better fit to lead the line. Borini aside however, Liverpool don’t have anyone else who can do it having let Andy Carroll go. Carroll’s time at Liverpool was unfair on the big Geordie. Brought in for far more money than he should have been, the bar was set too high – his lack of goals drawing the most attention despite his type of forward being more of a supplier than a scorer of goals. 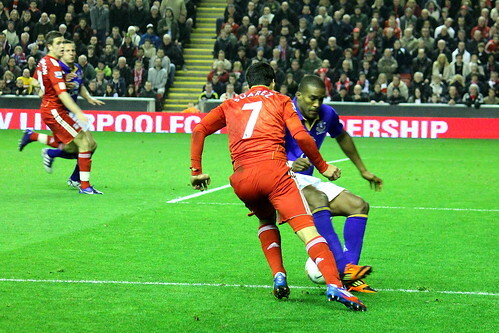 His performance against Man City was the greatest example of what he could have given Liverpool, not because of his two goals, but because of the way he was treated like the rest of the team – his height treated as a bonus way of getting the ball forward rather than the focus – but it was a rarity in his year and a half as a Liverpool player. Carroll’s inclusion usually signalled a stream of long balls forward; a poor supply most of the time made plain stupid by the lack of support he received when he did manage to win the ball. Unless they force-feed Suarez an ocean’s worth of whey protein, Liverpool no longer have a strong target man, nevertheless, in Rodgers’ system there is no place for one. Barcelona and Arsenal have shown there is a risk dedication to possession football can make a team too predictable, with teams happy to sit back and let passing teams keep the ball in front of them, yet the frequency of hopeless long balls up to Carroll last year suggest it may be better to give the team no option but to play it along the floor, at least until the team settles enough to be trusted to only use hoofs forward as a Plan B. The crux of the matter is that, right now, sections of Liverpool’s squad can’t be trusted to play the way he wants them to. The thin squad might have its benefits by forcing Rodgers into bringing through youngsters who have been playing his favoured type of football more, and to a higher quality, than many of the first team have, yet he really shouldn’t be put in a position where he has no other option. The club was badly mismanaged over the summer, but it is now up to Rodgers to make the best of a bad situation, and he’s impressed so far.